RockChickenz: IGGY POP Joins HOTEI for New Single/Video "Walking Through The Night"
IGGY POP Joins HOTEI for New Single/Video "Walking Through The Night"
Japanese superstar HOTEI has just released the video for his new single "Walking Through The Night," which features the iconic IGGY POP on vocals. SPIN premiered the video today here. Iggy explains his inspiration for the track; “I tried to put myself on a late night brightly lit Shinjuku street, feeling alone, sexually vulnerable and a little bit angry… a little bit horny…” GUITAR WORLD premiered an exclusive interview of Iggy discussing working with Hotei which can be seen here. The track is taken from the album Strangers which was released in the U.S. in July 2016 through Spinefarm Records and is Hotei’s first international release. The album features an array of guests including Emigrate/Rammstein’s Richard Z. Kruspe, Bullet For My Valentine’s Matt Tuck, Noko from UK electronic band pioneers Apollo 440, and acclaimed Texan singer Shea Seger, alongside the godfather of punk, Iggy Pop. "Walking Through The Night" also features long-time live fan favorite "Power" as the B-Side to the release. Only recently recorded for the first time in the studio, "Power" also comes with an accompanying video of him performing the song to a sold-out crowd of 10,000 people at the Yoyogi Gymnasium, Tokyo. 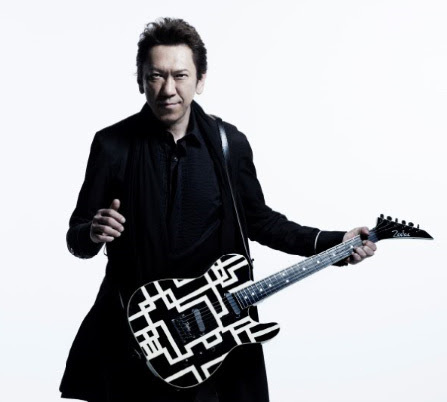 2016 also marks Hotei’s 35th anniversary in music and to celebrate this milestone, Hotei has been touring Japan extensively including over 50 live dates ranging from intimate club shows, to a free open-air concert in his hometown in front of 25,000 fans and will be ending the year with his 31st performance at the Budokan in Tokyo on December 30, with a very special fan request show. Not one to rest on his laurels, Hotei has been focusing on his international career and this year sold-out his first-ever LA show at the legendary Troubadour, and the Highline Ballroom in New York. He also guested on Italian rock star Zucchero’s latest album and performed with him recently in Verona and at the Royal Albert Hall. Heralded by Time Out as “iconic”, and a genuine superstar in his native Japan where he has sold more than 40 million records, Hotei is best known internationally for his Kill Bill theme "Battle Without Honor or Humanity" and is sought-after as a collaborator both in the studio and on stage.